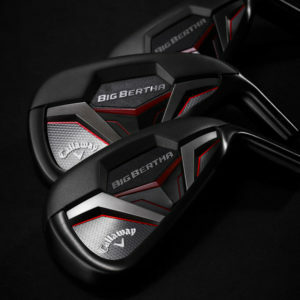 Big Bertha is one of the most iconic names in golf equipment, designed to push the boundaries of innovation so far that it transforms an entire category. This franchise started with our Big Bertha Irons in 2014 led by our 360 Face Cup™ technology, and continued in 2016 with Big Bertha OS Irons led by our EXO-Cage™. And we’ve done it once again with the new Big Bertha Irons, led by our groundbreaking Suspended Energy Core. It starts with a Metal Injection Molded (MIM’d) Tungsten Floating Weight suspended within our proprietary urethane microsphere material. Suspending the floating weight allows us to position the Center of Gravity deeper using a 3-piece iron construction. 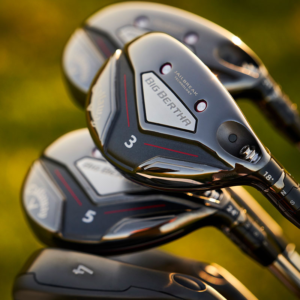 Now we can create higher launch while allowing a thinner, faster Face Cup construction. That combination promotes distance-enhancing launch conditions we’ve never been able to achieve before in an iron that’s also extremely easy to hit. All of this advanced technology is packaged with a stunning look, and new premium Recoil and KBS shafts. Big Bertha has an unforgettable look with its clean Smoked PVD Finish. Available with new Recoil ESX, Recoil ZT9, and KBS Max 90 shafts. The ultra-thin, Carpenter 455 steel face is extremely fast. That, combined with our Hyper Speed Face Cup, promotes fast speed across the face to promote long distance on center hits and off-center hits.